ASUSTOR NAS is the first in the world to support the local output of surveillance feeds via HDMI, users can choose between single and four feed displays as well as automatic cycling between single feeds, users can also use the official ASUSTOR remote, AiRemote mobile app, or a keyboard and mouse to control their viewing experience, users will now be able to expand their total number of channels via purchasable camera licenses providing additional flexibility. Additional features included in Surveillance Center 2.1 include IVA (Intelligent Video Analytics) playback, user defined cameras via Generic RTSP, camera patrol functions, remote viewing of surveillance feeds via the mobile app, and new compatible camera models from Grandstream, TRENDnet and Lilin. 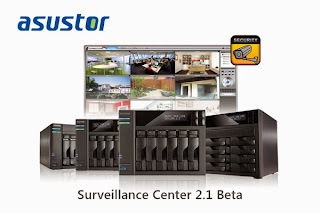 Taipei, Taiwan, June 24th 2014 – ASUSTOR Inc., a leading innovator and provider of network storage solutions, has announced the release of the Surveillance Center 2.1 beta version for all of its NAS devices. This new version of ASUSTOR's Surveillance Center features a range of upgraded functions that ASUSTOR users are sure to enjoy. In addition to the 4 free IP camera channels that Surveillance Center offers, users will now be able to expand their total number of channels via purchasable camera licenses. This provides flexibility for users to incrementally expand their surveillance systems. ASUSTOR's 6 series NAS devices are able to support a maximum of 12 camera channels while 2 and 3 series devices are able to support a maximum of 8. ASUSTOR's Surveillance Center is the first in the world to support the local output of surveillance feeds from a NAS via HDMI. Users are able to enjoy the convenience of viewing their surveillance feeds directly on their TV without having to use a computer. While viewing, users can choose between single and four feed displays as well as automatic cycling between single feeds. Furthermore, users can use the official ASUSTOR remote, AiRemote mobile app, or a keyboard and mouse to control their viewing experience. The newly added features to Surveillance Center 2.1 include IVA (Intelligent Video Analytics) playback, user defined cameras via Generic RTSP, camera patrol functions, and new compatible camera models from Grandstream, TRENDnet and Lilin. Additionally, more comprehensive support for both Windows and Mac web browsers will be included along with the mobile app which will allow users to view their surveillance feeds remotely from anywhere and at any time. "ASUSTOR has always been devoted to providing the market with a highly expandable and cutting-edge surveillance platform," said James Su, Product Manager at ASUSTOR. "In addition to meeting the diverse demands of the market and integrating compatibility for even more IP camera models, this version of Surveillance Center will give users the ability to add new camera channels as the need arises, providing additional flexibility." Users using different ASUSTOR NAS models will be able to use a different maximum number of camera channels. ASUSTOR's 6 series NAS devices are able to support a maximum of 12 camera channels while 2 and 3 series devices are able to support a maximum of 8. Currently, after enabling the camera channel expansion function, Surveillance Center video feeds will only be viewable by the web-based platform or mobile app. Starting today, all ASUSTOR NAS users using ADM 2.1 (firmware) and up will be able to upgrade Surveillance Center from within App Central. Users who wish to test the camera channel expansion function may register at the link provided below. ASUSTOR will then select users to participate in the testing.